Salted Mixed Nut Butter Chocolate Chunk Cookies were supposed to be Salted Tahini Chocolate Chunk Cookies, but things went awry. 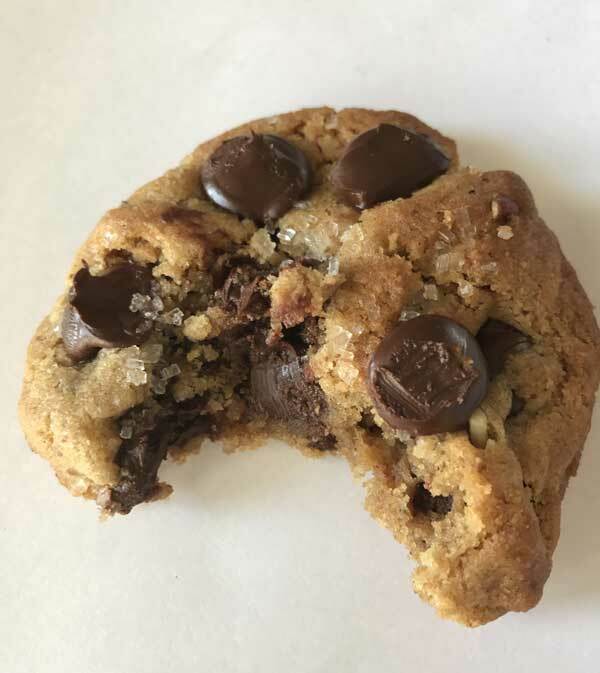 I had this grand plan to compare the The New York Times Salted Tahini Chocolate Chip Cookies to David Lebovitz’s version, but after gathering all the ingredients, I discovered the tahini had gone bad. Uh oh! 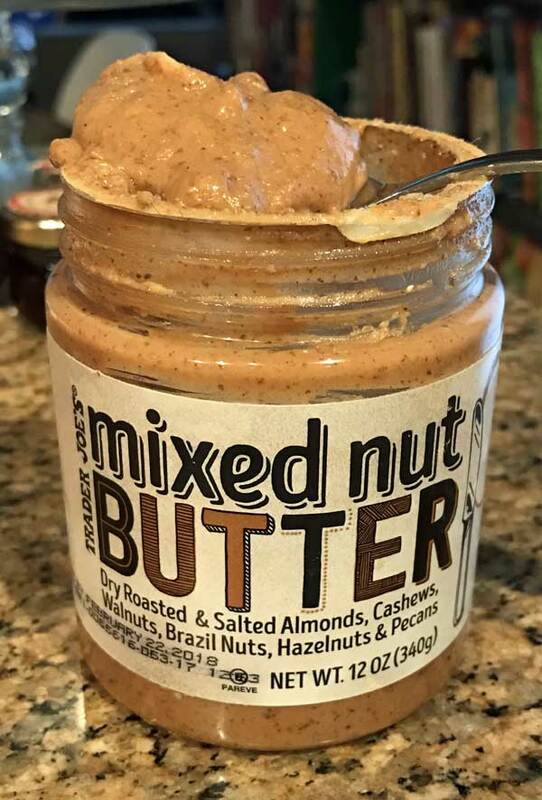 It was time for Plan B, which turned out to be Trader Joe’s Mixed Nut Butter. I am a big fan of Trader Joe’s Mixed Nut Butter, so it will be a sad day when they discontinue it (and they always do, don’t they?) But for now I’ll just keep buying it and enjoying the feeling that I’m getting a wider variety of nutrients from the mix of nuts. Almonds, cashews, walnuts, Brazil nuts, hazelnuts and macadamia nuts — they’re all in there. It’s not a sweet spread, so sometimes I add a little honey. I also chop up extra Brazil nuts and swirl them in too (selenium!). They turned out quite lovely! How they compare with the salted tahini variety will remain a mystery because I don’t see myself buying tahini again for a while. For now, these will do. They’re not too sweet, have scraggly tops, they brown nicely, and have a texture that’s not exactly soft, but not crunchy. It’s similar to a peanut butter cookie texture, but firmer. For these cookies I suggest adding an “accent” nut. Pecans work well, but any nut will do. Also, adding coarse salt or coarse sugar makes the texture and flavor even more interesting. And finally, you can really pack these with chocolate. The dough is fairly sturdy and not super sweet, so the more chocolate the better. 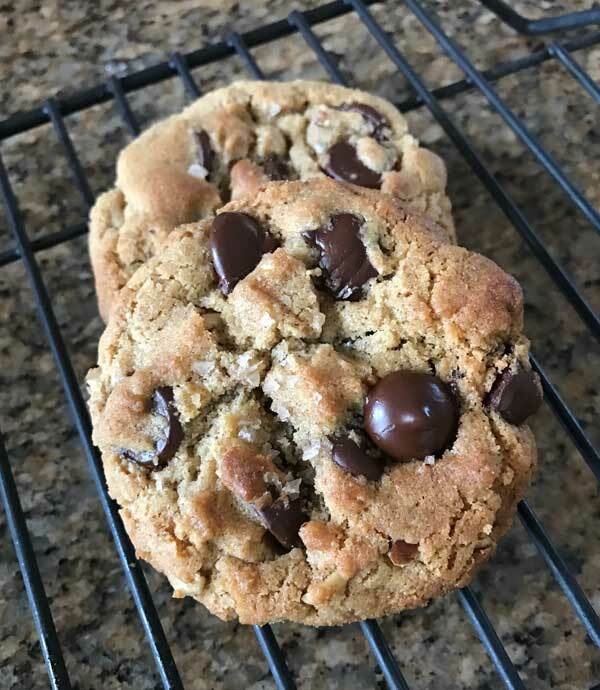 Mixed nut butter enhances the texture and flavor in these chewy chocolate chunk cookies. Thoroughly whisk together the flour, baking soda and salt. Set aside. In a mixing bowl, beat the butter, nut butter and both sugars until creamy. Beat in the vanilla. Scrape sides of bowl and add egg and the yolk. Mix by hand, then beat on medium speed until egg is blended in. Add the flour mixture gradually, stirring by hand until incorporated. Stir in the chocolate chunks and nuts. Portion dough into about 24 to 27 chunks and put on a lined baking tray or a couple of foil-lined plates -- whatever you can fit in your refrigerator. Chill dough portions for about 30 minutes or until ready to use. Preheat the oven to 350 degrees. Line two baking sheets with parchment paper or just leave unlined and ungreased. Arrange dough portions about 2 1/2 inches apart on baking sheets and sprinkle tops of cookies with flaky salt. Alternatively, dip tops in coarse sparkly sugar. Bake one sheet at a time on center rack for about 12-14 minutes or until cookies appear nicely browned. For the flour you can use 150 grams of all-purpose or use 120 grams AP and 30 grams of whole wheat. Sue, I have put Brazil nuts in cookies. I’ve also made Brazil nut butter, but it has kind of a strong flavor and really needs to be combined with other nuts. Speaking of which, you could just make your own nut butter by grinding up a bunch of nuts. That, or you could make the trek to TJ’s. These sound so good! Thanks for mentioning the mixed nut butter too. That sounds like something I would love. 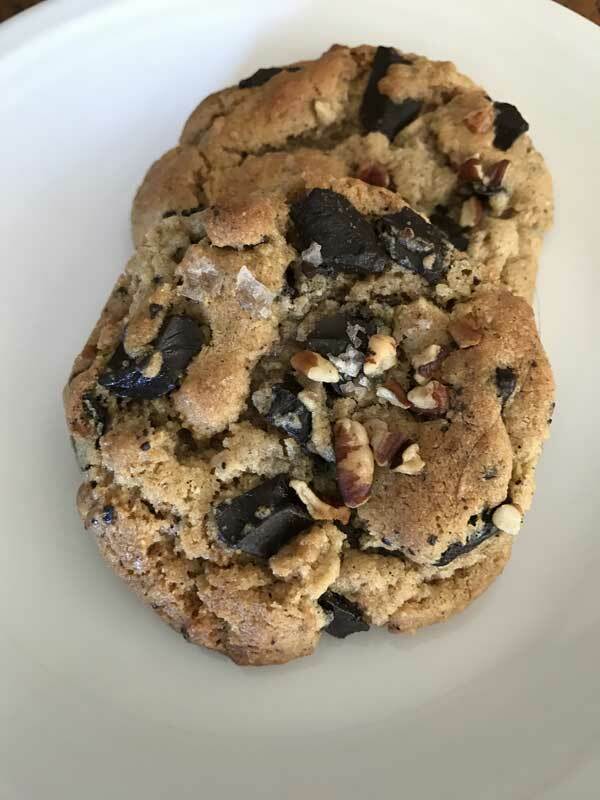 Have you ever put Brazil nuts in cookies? Panera used to have a cookie that included them but they no longer make them. I think it was a cookie with toffee in it. I want to make these cookies. The nearest TJ is about 45-50 miles from here so it will have to wait. @ Maureen, good to know that tahini freezes nicely – I’m making a note of that since I don’t use it very often! Anna, these cookies look and sound just perfect especially with all of your suggestions for chocolate, salt, and pecans. The TJ nut butter also sounds so nutritious! Maureen, I don’t know WHAT happened with my tahini. It was Trader Joe’s brand, and I opened it a few months ago. I closed it up and kept it in the refrigerator thinking it would have the same kind of life as peanut butter, so when I took it out I was really surprised to find it had developed the awful flavor. At any rate, I will definitely try freezing it!! !